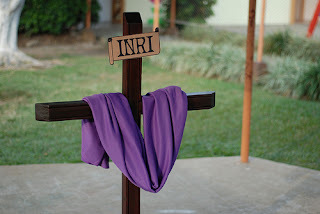 A cross at a school in Palmares, Costa Rica. After hearing a few comments on Facebook about the Common Error post about Semana Santa, I just wanted to mention a thing or two. First of all, I didn’t say that the phrase “Holy Week” is not used in English; I just said that it’s not common. I still believe that, at least in mast cases. It is used sometimes in religious contexts, as a few readers pointed out. The main thing I was trying to differentiate between was Semana Santa as it’s understood and practiced in Latin America, and “Spring Break” and “Holy Week” as they’re practiced in English-speaking countries. So, that’s it for the moment. If you have any comments or if you disagree with this, I’d love to hear from you. Oh, by the way, as you probably figured out, we were on break here in Costa Rica last week, and this week I’ve been catching up with work and other things, so I didn’t do a blog post for “Mistake Monday” or “Trouble Tuesday.” There will be one next week, though, so please check back then! Common Error: Phrases Related to "Semana Santa"